Recently named Interim Director for the School of Music, Robert Baldwin is Director of Orchestral Activities at the University of Utah and Music Director for the Salt Lake Symphony. He is also the conductor of UK Opera Theatre’s “It’s a Grand Night for Singing,” a post he has held for the past ten years. Previously, he has held conducting positions at the University of Kentucky, Lexington Philharmonic, New American Symphony, Flagstaff Symphony and Northern Arizona University Orchestras. He has conducted concerts across the United States and Europe. 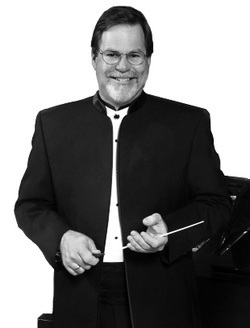 In demand as a conductor and clinician, Dr. Baldwin’s appearances include the AMKO Symphony at the Kuopio Academy in Finland, 2006 Mozart Orchestra Festival in Austria, the Hermitage Camerata Symphony in Saint Petersburg, Russia, and performances with the Lexington Philharmonic, Flagstaff Festival of the Arts, the Abilene Tri-Collegiate Opera, and numerous festivals and All-State Orchestras around the country. His performances have received national attention and been featured on National Public Radio’s “Performance Today” and “Weekend Edition.” In addition, his book chapter on preparing orchestral viola sections was recently published by the American String Teachers Association. In 2007, he was named the Higher Education Teacher of the Year by the Utah Chapter of the American String Teacher’s Association. In 2008 he was awarded the Faculty Excellence Award for outstanding teaching, creative work and service from the University of Utah College of Fine Arts. Also an accomplished violist, he has had a variety of experiences, including guest appearances with the Amadeus Trio, the Saint Petersburg and Stanford String Quartets, and the Sedona Chamber Music Festival. He was violist of the Arizona-based Coconino Chamber Ensemble from 1989-1999. He has been principal violist of the Flagstaff Symphony, Arkansas Symphony, and Arizona Opera and has performed with the Utah Symphony, Lexington Philharmonic, and Utah Chamber Artists, among others. Recent solo appearances include recitals in the US and Mexico. Dr. Baldwin has studied conducting in the United States and in Saint Petersburg, Russia. He holds degrees from the University of Northern Colorado, University of Iowa, and the University of Arizona, where he received the Graduate Achievement Award. His conducting teachers have included Mikhail Kukushkin, Alexander Polishuk, James Dixon, Duilio Dobrin, Eugene Corporon, and Gregg Hanson. He studied viola with Vernon Ashcraft, Ronald Smith, William Preucil, Sr., and Jeffrey Showell. He makes his home in Salt Lake City, Utah where, in his spare time, he enjoys reading, hiking, travel, and spending time with his wife and two children.